Knitting folk, you know I am usually all about the smaller yarn. I think somehow it looks nicer, you can do more with it, the stitch definition is usually better, and also, those are the needle sizes I have lots of. So…expedience. 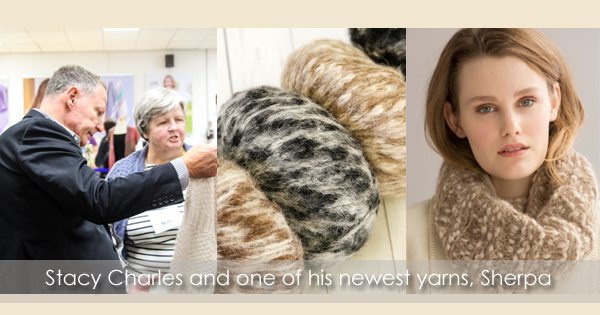 I recently was lucky enough to be in on a presentation given by Stacy Charles, whose name is probably familiar to all of you knitters. Their new yarn, Sherpa, was really popular at our recent Knitting Retreat, and at first glance, I thought “absolutely NOT.” It’s everything I thought I didn’t like in a yarn: fuzzy, big, random little boucle dots of natural color along the fiber. However, I then saw this yarn knit up in this absolutely gorgeous pullover with matching cowl, and it’s the antithesis of what I don’t like in bulky yarn. The Zest Pullover has a drapiness that I could compare to a superstar sportweight or DK yarn, not boxy or puffy, but smooth and shapely. The fuzziness of Sherpa is soft, not like a fuzzy yarn that you don’t want next to your skin. That cowl is about to be on my needles and I’ll finish it in a day, I bet. 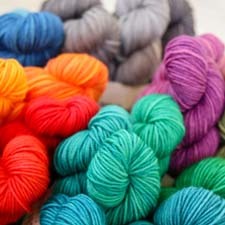 What’s the last yarn that changed your opinion? Let us know in the comments, below. This entry was posted on Friday, October 7th, 2016 at 8:30 am	and is filed under Products at WEBS. You can follow any responses to this entry through the RSS 2.0 feed. You can skip to the end and leave a response. Pinging is currently not allowed.